Made by Bimmini Special FX and Design Studios in Gold Coast, Queensland, Australia, 2000-2000. Consists of a head and torso cast in fibreglass. The 'skin' of the Kewpie is painted pink, the molded facial features and hair of the Kewpie have also been painted. A red bodice has been painted onto the torso of the doll. Two arms also cast in fibreglass attach to either side of the body. The arms are painted pink. Attaching to the base of the torso is the kewpie skirt. The skirt is attached to a wooden disk and consists of are layers green crinoline and tulle with red trim and sequins. The skirts are enforced with fibreglass and metal rods. The fibreglass head and torso attach to a steel trolley. The trolley is covered over by the full crinoline and tulle skirts of the Kewpie. Brian Thomson designed the over-sized kewpie dolls in 2000 for the closing ceremony, although the initial concept for the kewpie doll originated in 1909, in the American Ladies' Home Journal magazine. In this publication, Rose O'Neil published children's poems and illustrations of characters that would become kewpies. Her cartoon drawings evolved into paper dolls and then into unglazed ceramic versions which gained popularity. Named after its resemblance to Cupid, a kewpie doll had big cheeks, wide-eyes, webbed hands, a tuft of hair and a round tummy. 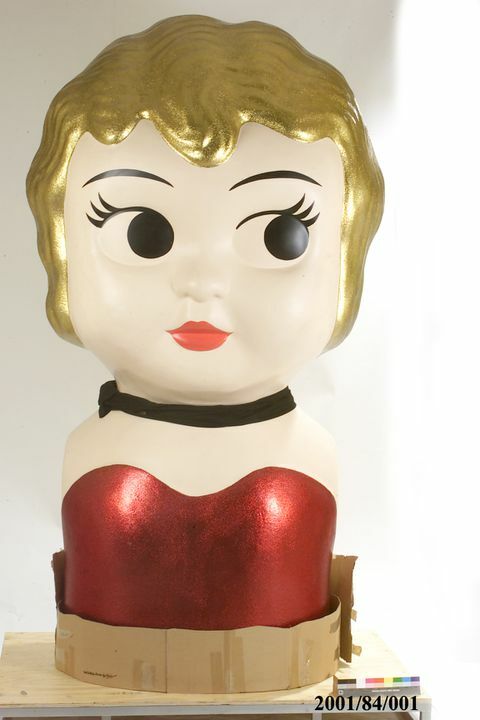 The kewpie dolls were made in 2000 by James Colmer and Lara Denman at Bimmini Special FX and Design Studios, Queensland. The dolls were made there for secrecy and sent to Sydney at the last minute. Colmer and Denman were given as a design reference a plastic kewpie doll approximately 100mm tall, and were asked to make twelve gigantic ones. Due to the scale and timeframe, they sought help from Coastal Fibreglass in Nerang, who did the moulding .The head and body were sculpted in polystyrene and then cast to form the fibreglass shell. The skirts, made in coloured tulle, were stiffened with concealed fibreglass rods suspended in concentric circles from nylon webbing. A glittery fabric edged the skirt and matched the torso of the kewpie doll dress. A team at Carrara Sewing made the dolls' dresses. Each doll rested on a welded, steel-base trolley, made by the Ceremonies Workshop. Used during the Sydney 2000 Olympic Games closing ceremony, 'Let's Party' segment, Stadium Australia, Sydney Olympic Park, Homebush Bay, 1 October 2000. Made for and owned by the Sydney Organising Committee for the Olympic Games, and donated to the Powerhouse Museum after the Games.